I am always looking for things for my kids to do, which one of things and I found was the MindWare Dig It Up! 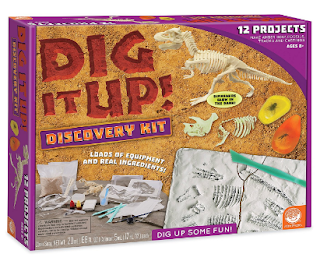 Discovery Kit, The Dig It Up! Discovery Kit comes with everything needed to do 12 fun crafts. My kids and I only did a few of the crafts today and will explore more later. The first craft we did, (more for me to get an idea of what a mess this might make) was the Amber Casting. 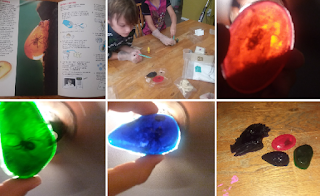 It was very simple, first each kid got to pick out which bug they would like to place in the mold, then we added the dye and I had some left over food coloring which we used and made a bigger dino head. We placed the molds in the fridge and a hour later had fun "Ambered" bugs.....aka fun soap for tub. I was happy that it was simple enough that the kids could do on their own, and not make a mess. The kit comes with 2 sets of dinosaur bones which can be used to burial, mold, and even put them together like a puzzle which even glows at night. 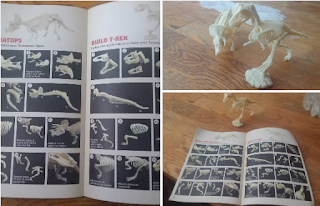 So this was the next thing my kids decided they wanted to do, which was building the dinos. Another craft we did was making a Fossil Rock or in other words making a excavation site, so each kid had fun placing the bones into the mixture. After letting sit most of the day the kids later had fun digging out the bones to rebuild the dinos. Finally the last craft we did for the day was the casting, we used the claw and let sit, it came out a little thinner than it should've but I know I did the directions wrong, but the kids had fun doing so who cares. My kids really enjoyed playing with the Dig It Up! Discovery Kit by MindWare that they continued to do other projects with the kit. You can purchase the MindWare Dig It Up! Discovery Kit on Amazon and by visiting their site here. TOYS THAT TEACH: The Dig It Up! Discovery Kit from MindWare contains more than just your average dinosaur toys for kids, it contains wonderful activities that will provide children with invaluable knowledge and hours of fun. EDUCATE AND CREATE: Learn about the thrilling world of dinosaurs as you excavate and assemble a Tyrannosaurus and Triceratops skeleton, or even cast a Pachycephalosaurus skull. 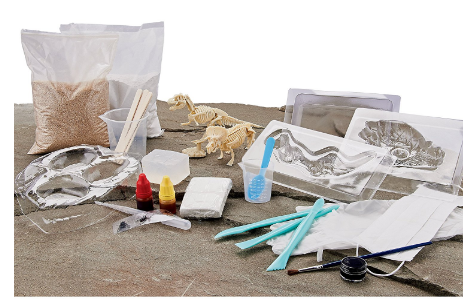 DIG UP SOME FUN: For geological activities that really rock, this kit also lets you create replicas of amber stones with preserved prehistoric insects, and trace fossils that can teach you how rocks can hold secrets from millions of years ago. INSPIRE SCIENCE EDUCATION: Whether your interest is creating your own dinosaur skeletons or just looking at one of their claws; painting artifacts or simply learning about fossils, Dig It Up! Discovery Kit has a fund educational adventure for you. 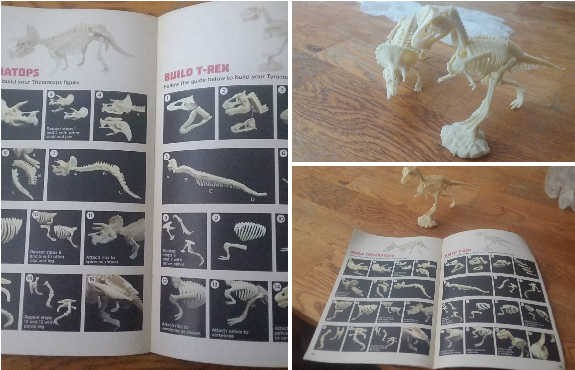 INCLUDES: Instruction book, clear soap base, plaster of paris powder, fine vermiculite, modeling clay, food coloring, black paint, pachycephalosaurus skull mold, allosaurus claw mold, amber soap mold, rock mold, two beakers, tyrannosaurus rex skeleton, triceratops skeleton, bug decals, digging tools, paint brush, stirring sticks, pipette, scoop, plastic magnifying glass, safety mask and gloves.